Today's recipe is Lord Ganesha's favorite sweet, Modhagam / Sweet Kozhukattai for final of Blogging Marathon under the theme, Vinayagar Chaturthi Special. My Grand pa used to say more stories about God(purana kathaigal) n i remember the one about Lord Ganesha. In that story, He told about the birth n power of Lord Ganesha. Of that entire story, Ganesha's childhood part is my favorite, hope its favorite of many of u rt?! I loved the recent movie about the childhood part, Bal Ganesh. In that movie also they have shown like Lord Ganesha love lots of Modhagam n he eats more n more and thus he got such fat body :) That's y we offer this Modhagam to Ganesha on Vinayagar Chaturthi, so that Lord will be more happy by our offering and Bless us with all our needs. These are all small believes n it does not necessary to offer something to God to get his blessings. Simply a whole hearted Prayer n strong belief makes our life peace n happy. May Lord Ganesha gives u all happiness n peace. Oil 1 tsp + to grease hands n idly plates. First make filling n then the outer covering. First dry roast sesame seeds till light golden brown n flavor comes, then remove from the heat n keep aside. Heat a pan, add jaggery n 1 tbsp n keep stirring once the jaggery get dissolved completely, filter the jaggery water using tea filter and again bring it to boil until it gets single string consistency. After that add shredded coconut and cook for 1-2 minutes, now add roasted sesame seeds and mix well. Keep stirring until it gets thicken and start rolling. Lastly add cardamom powder and mix well and remove from heat. That's it...Coconut sesame filling is ready, allow this cool. Now start making rice flour dough/outer covering. In a vessel, add water, oil n salt and bring it to boil. Once it starts boiling add rice flour, do not mix and just close the vessel with lid and leave it for 3 minutes and turn off the stove. After 3 minutes, mix the rice flour using a wooden ladle, keep the mixed dough in a damp/wet cloth for 5 minutes. After that, grease your hands with oil and start kneading the dough to a non-sticky, smooth dough. Then divide the dough in to 10-12 lemon sized balls. Now, grease your fingers, take one ball n flatten it gently to 3" circle, and keep 1tsp filling and bring all together n seal it by pressing ends. (similar to stuffed paratha but the edges little thin n the center part little thick) or simply fold it(like shown in the below pic) n press the edges tightly. Do repeat the same for remaining dough n filling. Once done, arrange the shaped modhagam in to a greased steaming plate or idly plate and steam cook it for 10-12 minutes. That's it, wait for a minute and then carefully take out the cooked modhagam n serve. The method i mentioned here for outer covering is so easy n also it gives u the perfect dough texture. This rice flour dough is perfect for making ammini kozhukattai. I used store bought rice flour(Lakshmi Brand) only. If u don't like sesame seeds just omit it n increase the coconut amount to 1 cup n proceed with the rest. The filling remains good for up to a week or 10 days, if refrigerated. The left over can filling can be used to make polis or sweet chapathi. I love this so much Sangeetha..looks so nice..
Looks so nice,love it a lot..
Looks absolutely delicious...yummy looking kozhukattais....!! I love this filling very much,the most flavourful filling than the channadal na..Seriously our kids missing all those lovely moments especially listening stories about gods and all with grandparents na. Thats truly a disadvantage in living far away for our birth place. simple delicious and so perfectly done. 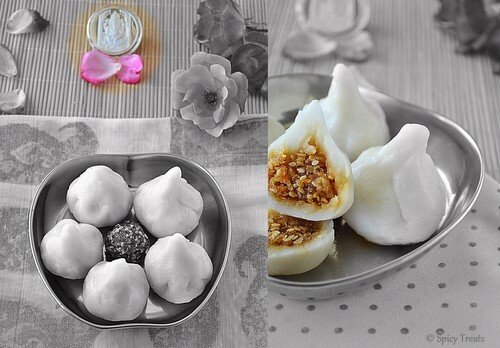 yummy modaks!..have never tried making these..must try them!